The Strange Self-fulfilling Prophecy of The Shaggs. Today on DCotU we are going to talk about the rock sensation that is The Shaggs. A band so bad that they are good. No, let me take it back they are a band so bad they are horrible. Yet they have influenced their fans’ music, fans like Frank Zappa, Kurt Cobain and Bonnie Raitt. But what we here at Dave’s think is interesting, is not their gosh awful music but the ancient prophecy that drove them to a musical career. The mutterings of a 1950’s Gypsy grandmother is an ancient prophecies right? The band was composed of Dot, Betty, and Helen Wiggin (and later younger sister Rachel). The Shaggs were created by their father Austin Wiggin. His mother a self-proclaimed Gypsy fortune teller said he would meet a red haired woman, and they would marry have daughters and said daughters would form a band that would change music history. Since the first two happened the third must also be true, right? The Shags were formed in Freemont Delaware whose non-Shaggs claim to fame was a 1965 UFO flap and the first place a B-52 bomber crashed that did not result in a fatality. Austin pulled his daughters out of school and home schooled them so they could concentrate on their music. The girls were really not excited about this but their dad was not the kind of guy you said no to. The guy who made the thousand records stole nine-hundred of then. The remaining hundred were circulated among New England Radio stations. Where they were generally seen as a joke. The Shaggs disbanded in 1975, when Austin passed away and the girls then went on with their lives. Eventually the girls moved out and their mom sold their home/musical prison. The new people wanted to build a new house on the land and burnt down the old one down. To this day they claim to have seen the ghost of Austin Wiggin forlornly looking out the window as his dreams were burnt to the ground. The hundred remaining copies of their album survived and fell into some pretty influential hands. Their first national exposure was in the 70’s when Frank Zappa played them on The Doctor Demento Show. Zappa is supposedly said that the Shaggs were better than Beatles. It is doubtful that he said that but if he did then it was probably in jest. Bonnie Raitt, described them as “Castaways on their own musical island.” Because there father would not allow them to have any other musical influence. To people who real understand music it is ‘a real thing’ to the rest of us it is just a pop ketch album. The songs were re-released and Rolling Stones which basically dissed the girls as zombie like called them “The comeback of the year.” They get shout outs in the movies Empire Records and The Perks of Being a Wallflower. They were subject of a BBC radio documentary. And a play about the girls is being made into a movie. I tried to listen to their record which is thirty-two minutes long. I got through twelve minutes. In fact on my second try my computer shut itself down. The thing that is obvious to anyone listening to it is that the girls relay don’t want to be there. They have all the enthusiasm of kids being forced by their parents to take advanced math exams. When I moved into my apartment back in Oxnard California, a 15 year old neighbor kid asked if it was OK, that he practiced the guitar. Since he didn’t do it early in the morning or late at night I said “sure”. He actually wasn’t bad, but you could hear as he played the same old Kansas song over and over he really loved the music. You could hear is dedication and enjoyment in his work, even if it wasn’t at a professional level. So I relay kind of began to dig it, and missed it when he moved. 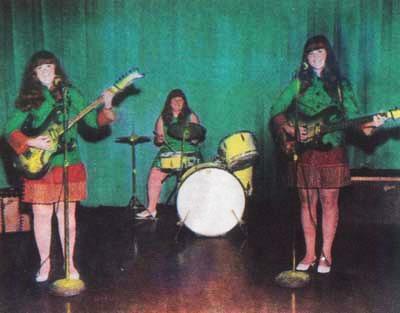 But that love of what they were doing the musicians passion is missing from The Shaggs performance. In ways The Shaggs are the modern model of the DIY music scene. Right or wrong Austin Wiggn’s blue print to stardom is now followed by many garage bands. And it all started with a fortuneteller’s prophecy. Too bad they did not listen to other music, fall in love with it, because they had a lot to rebel against, and rebellion is the heart of rock and roll. Hadn’t thought about that but yes that is true. this is the sound of nightmares. It’s like, imagine sounding like the Residents without trying to sound like the Residents..
Kind of a world of their own. This entry was posted on June 4, 2015 by davekheath in Music, paranormal, strange, The Shaggs.